Preheat oven to 350 degrees. Grease and flour 2 9" loaf pans. 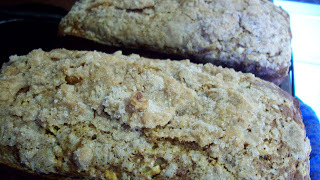 Coarsely grate 2 apples (think zucchini bread). Cream together applesauce, pumpkin, sugar and eggs. In a separate bowl, combine flour, salt, baking soda, cinnamon, nutmeg, and cloves. Add to wet ingredients and mix until just incorporated. Fold in grated apples. Pour batter evenly into prepared pans. Combine topping ingredients, working butter into mix with your fingers until crumbly. Sprinkle on top of loaves. Bake for approximately 1 hour, until a skewer or knife inserted in the center comes out clean. Let cool for about 15 minutes and then remove from pans and finish cooling on a wire rack. This bread is great plain or topped with a little apple butter.